In early March, four Syrian men filed a lawsuit against Japan’s Ministry of Justice, challenging the rejection of their refugee applications. 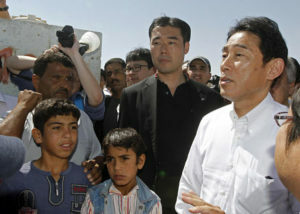 The group arrived in Japan in 2012 and applied for refugee status, citing the potential for persecution for their participation in pro-democracy protests against the Syrian government. The Ministry rejected their refugee status in early 2013, and instead granted them each a temporary residence permit under a “humanitarian perspective.” This type of permit allows the men to work full time and to participate in the national health care and other social programs. But while this seems like a compromise, the permits must be renewed every year, unlike refugee certificates which are permanent; and permit holders are excluded from certain assistance programs such as language training and employment help that the government grants to certified refugees. Perhaps the greatest disadvantage the lack of refugee status prevents for the Syrians is the difficulty, or near impossibility, it is to get their families into the country. Their lawsuit seeks to obtain official refugee status and the full rights and protections that it provides. Japan’s Immigration and Refugee Recognition Act explicitly refers to the 1951 Convention in its definition of “refugee” as well as in the reasons a temporary refuge may be granted at the border. Further, the Ministry of Justice itself uses the Convention’s definition of a refugee in its guidelines for refugee status. The Convention defines a refugee as a person who has a “well-founded fear” of persecution. In practice, the Ministry tends to grant refugee status to those who are in danger of being “personally targeted” by their home government which, according to the lawsuit, is a higher standard than what the Convention requires. The Convention’s language of having a “well-founded fear” is too vague on its face to offer any sort of guidance, and the term has no further definition anywhere in the Convention. Instead, the United Nations High Commissioner for Refugees (UNHCR), provides a handbook to “guide government officials, judges, practitioners, as well as UNHCR staff applying the refugee definition.” In this handbook, the UNHCR considers the term “well-rounded fear” to have both a subjective and objective element. Subjective in the person’s motivation for seeking the refugee status; and objective in viewing that motivation within the context of their country of origin or what brought about the motivation in the first place. When considering whether there is a “well-founded fear”, the UNHCR places most of the weight on the subjective element while the objective element provides a context to assess the credibility of the refugee. With this framework in mind, will the Syrian refugees’ case against the Ministry be successful? The answer, naturally, depends most notably on the Ministry’s use of “personally persecuted” when determining refugee status. Assuming that the terms “personally persecuted” mean that the person is being targeted by their home government and will be arrested the moment they step off the plane, it would seem that the Ministry puts more weight on the objective element of having a “well-rounded fear” instead of the subjective element as the UNHCR states. Indeed, if a requirement for refugee status is to be a target, then this would effectively do away with the term “well-founded fear of persecution” and replace it with “actual persecution.” Supporting this interpretation are further explanations in the UNHCR handbook. A refugee’s fear of persecution, according to the handbook, need not be based on their own personal experiences or the fact that they have previously been persecuted. The fear could be based on persecution of people in a similar situation, or persecution of friends or family. The UNHCR further considers that “fear” applies both to those who have actually been persecuted and those who wish to avoid being persecuted. The Ministry’s standard of “personally persecuted” could be found to be incompatible with 1951 Convention and the standards of the UNHCR. Japan has been a party to the 1951 Convention since 1981 and has given no reservations or declarations to any provision. As such, the Ministry of Justice should be bound by the provisions in the Convention and it is likely that it has applied a higher standard than is necessary. If the lawsuit is successful, it will provide hope for the hundreds of refugee seekers who have been denied the status due to Japan’s rigid and restrictive system. Leonard Large is a 3L at the University of Denver Sturm College of Law and is Candidacy Editor for the Denver Journal of International Law and Policy. 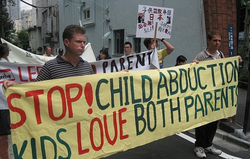 In 2013, Japan joined the Hague convention on the civil aspects of child abduction. The convention took effect on April 1, 2014. In October 2014, a child has been returned to his father. The boy was born in Germany to a German father and a Japanese mother. He lived in Germany until June 2014 when his parents split and his mother took him back to Japan—a situation all too common for international marriages. While this marks the first time that a child has been returned from Japan to a foreign parent under the Convention, the first case under the Convention occurred in July 2014 and involved a child being returned to Japan from the UK. Two other cases followed in September 2014 and those also involved a child being returned to Japan from abroad. As of November 2014, the Ministry of Foreign Affairs has 14 requests for the return of children from Japan and 9 for the return to Japan. Considering the small differences, these numbers bring about a more pressing question: were Japan’s reasons for not previously adopting the Convention truly justified? One such parent was Christopher Savoie, a Tennessee man who had two children with his Japanese wife. When the couple divorced, Savoie was awarded custody of the children by the U.S. courts. In 2009, the mother took the children on a trip to Japan but never returned. When Savoie went to Japan to get the kids, he was arrested and detained on charges of kidnapping. Because Japan was not a party to the Convention at that time, Savoie’s only legal recourse would have been to go through the Japanese family courts. However, the U.S. custody award would have done very little to convince the Japanese court to return the children, not to mention the logistics of having to retain a local attorney for the matter. With his only legal recourse rendered futile, Savoie decided on an alternative and it lead to his arrest. Stories like Savoie’s are common for international marriages between foreigners and Japanese. But while Savoie got noticed, others get lost in the shadows. Of the registered international marriages in Japan in 2009, the year of Savoie’s struggle, 78% were between a Japanese man and a non-Japanese bride. Japan’s reluctance to implement the Hague Convention neglected the needs of its own citizens in international marriages despite the country’s purported reason being a desire to protect Japanese nationals. The current number of Japanese nationals seeking return of their children to Japan under the Convention belies that reason and suggests that there may have been a number of Japanese parents in Savoie’s position that got lost in the shuffle. Japan is a nation full of history and beauty. It is a nation with some of the kindest and most hospital people that one will meet. Yet, it is also a nation that continues to struggle with a divide between Japanese and non-Japanese. Social customs, laws, and the courts have an uneasy track record of disparately treating non-Japanese nationals and Japan’s long reluctance to accept the Hague convention underscores that divide. But in doing so, Japan may have harmed more of its citizens than it protected. The number of Japanese parents seeking return of their children to Japan under the Hague Convention suggests that there might have been many other parents in Christopher Savoie’s situation: left behind. Leonard Large is a 3L law student at University of Denver Sturm College of Law and Candidacy Editor for the Denver Journal of International Law and Policy. Posted on 03 December 2013. Tags: Air Defense Identification Zone, China, dispute, Japan, territory, U.S.
On November 23, 2013, China declared an Air Defense Identification Zone (ADIZ), which stated that “aircraft in the area must report their flight plans to China, maintain two-way radio and clearly mark their nationalities on the aircraft.” China’s declaration has drawn harsh criticism from Japan and the United States. 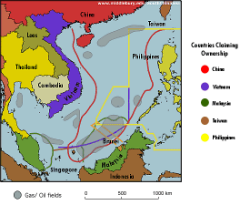 While ADIZs are not a new concept, China’s ADIZ has created tension because the zone includes a chain of islands that are the center of a long dispute between China and Japan. ADIZs are declared by many nations, allowing the territory to potentially stop unfriendly aircraft from entering its airspace. James Hardy, the Asia-Pacific Editor of IHS Jane’s Defence Weekly, stated that an ADIZ is “unilaterally imposed, so it doesn’t really have a legal basis and isn’t based on negotiations with neighbors.” The ADIZ includes the Daioyu/Senkaku islands, which both Japan and China claim as part of their territory. The disputed islands, called Senkaku Islands by Japan and Diaoyu Islands by China, are claimed by both Japan and China. China claims that Chinese fisherman began using the islands in the 1400’s, and has had a right of ownership ever since. However, Japan recognized the islands as part of its territory in 1895, after conducting a survey in which it “saw no trace of Chinese control of the islands.” After Japan’s surrender at the end of World War II, the islands were “administered by the U.S. occupation force.” Once the U.S. withdrew in 1972, the U.S. returned the islands back to Japan. On November 26, two United States Air Force B-52 planes flew over the ADIZ, and the pilots did not identify themselves as required by China. Although the United States has stated that it does not recognize China’s ADIZ, it is urging commercial pilots to adhere to China’s new requirements, citing safety reasons. However, Japan has stated that its commercial airlines will not follow China’s requirements. As tensions rise in the Pacific, the U.S. has cause for concern – Japan and the U.S. have “a mutual security treaty.” Although the Treaty does have a provision where both parties undertake to solve disputes peacefully, Article V of the Treaty recognizes that each party would “act to meet the common danger” in the event of an armed attack in Japan. Posted on 27 November 2013. Tags: air defense zone, China, dispute, Japan, Senkaku islands, training exercise, U.S.
On Monday, November 26, the United States sent two B-52 bombers over a group of disputed islands in the East China Sea after China recently declared that the islands were within the country’s air defense zone. 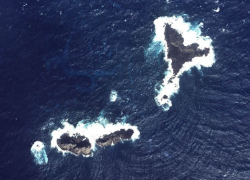 The disputed islands, called the Diaoyu Islands by the Chinese, and the Senkaku Islands by the Japanese, are at the heart of an international dispute in which each country claims the islands as their own. After China released new coordinates for its air defense zone, the U.S. flew two unarmed B-52 bombers over the disputed islands. The islands are prized for their strategically significant location to nearby shipping lanes, and for their potential abundance of natural resources. Modern dispute over the ownership of the islands has existed since the 1970s. However, the dispute over the islands seems to be escalating. A little over a year ago Japan sent fighter jets to the islands after a Chinese plane was sighted in the area on December 13, 2012. That marked the first time that aircraft became involved in the dispute. A little less than a year later, on November 23, 2013, China released information pertaining to the coordinates of its new air defense zone, which happens to encompass the Diaoyu/Senkaku islands. It accompanied the release with a declaration requiring any aircraft entering the zone to clearly mark the nationality of the aircraft and for pilots of the aircraft to identify themselves and to report their flight plans to Chinese authorities. Additionally, China claimed that it would defensively respond to aircraft that refused to follow these procedures. Three days later, the United States flew two unarmed B-52 bombers over the islands, which lie within the new Chinese air defense zone. The United States claimed that the flyover was part of a training exercise. The United States conducted the exercise following its normal procedures, which disregard China’s new requirements for aircraft entering the zone. China has not directly responded to the actions of the U.S., but claims that the new air defense zone is a proper exercise of its right to self-defense and territorially integrity. The institution of the Chinese air defense zone and the United State’s flyover of the Diaoyu/Senkaku islands demonstrate that tensions over the disputed islands are escalating. These events come on the heels of a recently released statement by the United States about its focus on enhancing security in the Asia-Pacific region through increasing the presence of U.S. forces. With a larger U.S. presence in the region, and with an already strained relationship between China and Japan, a diplomatic resolution is needed sooner rather than later. In fact, a peaceful resolution to the Diaoyu/Senkaku dispute could help build a bridge to better relations between all parties involved. From June 26th to July 16th the International Court of Justice (ICJ) will hear arguments from Australia and Japan over the dispute concerning Japan’s whaling program. This will be Japan’s first appearance as a party before the ICJ. The court proceeding began in 2010 and has so far cost Australia over $20 million dollars. Australia and Japan are key trading partners and both countries have said that the ICJ is the appropriate forum for a dispute between friends; yet, it is believed Japan will defend their case by arguing that the ICJ lacks jurisdiction and that the Japanese whaling program is not a violation of international obligations because it is only for scientific purposes. The ICJ is known as the World Court and has dual jurisdiction – to resolve disputes in accordance with international law that have been submitted to it by States or to give advisory opinions at the request of the UN or other specialized agencies. Australia maintains that this case falls under the first prong of the court’s jurisdiction. Australia believes Japan has breached its duty under the 1986 International Whaling Commission ban on commercial whaling by hunting the whales and labeling it a scientific program. 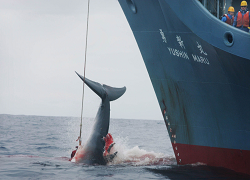 Australia states that Japan has killed over 10,000 whales since 1988. In comparison, in the 31 years prior to the ban, only 840 whales were killed for research. Tension over this issue between the friendly nations has been building since 1999 when Australia named the Southern Ocean a sanctuary for whales. Australia holds strong to the position that commercial whaling should be outlawed. Japan argues that their whaling program is for scientific research to prove commercial whaling is viable and therefore exempt under Article 8 of the International Convention for the Regulation of Whaling. Although the whales are killed for scientific research, the whales are brought back to Japan and sold for meat,which is why Australia believes the program is actually a commercial enterprise. Japan defends their right to whaling as part of a culinary tradition and cultural practice; however, whale consumption is significantly low in Japan and it is reported that 5,000 tons of unsold meat remains in storage. Those who side with Australia note that scientific research on sustainable whale populations can be done without slaughtering the animals. Scientists can use listening devices to track the whales, locate them, and then attach satellite devices to learn more about their breeding and feeding behaviors and patterns. Asking the court to preserve the whales may seem like an emotional stance but a decline in the species affects the marine ecosystem and tourism connected with whale watching expeditions. The ICJ has also permitted New Zealand to intervene in support of Australia’s position but the ICJ did not grant New Zealand status as a party to the case. Conversely, Norway and Iceland, which have commercial whaling programs, have not moved to intervene in support of Japan’s arguments that whaling is a cultural tradition. Not only is Australia arguing that commercial whaling should cease under the International Whaling Commission ban, but the Animal Welfare Institute has also cited that any attempts, including those by both Norway and Iceland, to sell whale products is banned by the Convention on International Trade in Endangered Species of Wild Fauna and Flora. Iceland has one company that hunts fin whales and the only country it sells to is Japan. However, Iceland also allows for the hunting of endangered minke whales and has exported 3,000 tons of whale meat to Japan since 2006. The final ICJ decision could impact Japanese public perception on the practice of whaling, which in turn may affect Iceland’s trade with Japan. The case is a large gamble for conservationist nations because the ICJ’s 16 judge panel decision will be final, binding, and with no appeal; the outcome could risk the lives of numerous whale populations. The Attorney-General Mark Dreyfus is hopeful that Australia will win the case and that the ICJ decision will come before the end of the year, preventing the next season of hunting. This case is one that all international and environmental lawyers should tune in for – the public hearings will be broadcast live on the International Court of Justice’s website at www.icj-cij.org/presscom/multimedia.php?p1=6. Kristen Pariser is a rising 3L, a Staff Editor for the Denver Journal of International Law and Policy, and Executive Editor for The View from Above blog. 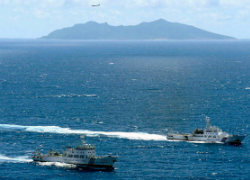 Maritime disputes between the Japanese and Chinese continue to escalate. 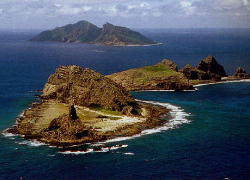 The Japanese-named Senkaku Islands, and the Chinese-named Diaoyu Islands continue to be a major source of conflict between the two nations. Last week, the situation escalated when Japan scrambled fighter jets after a Chinese plane flew over the islands. Though other island disputes between these and other countries exist, this is the first time the dispute over these islands has involved aircraft. These territorial tensions have only risen since Japan purchased three of the islands from a private owner three months ago. Both countries have attempted to claim the right to these islands since the United Nations survey declared that the islands were rich in resources, the most important being oil. The issue has only increased as oil prices have risen in both countries. This latest action on the part of the Chinese is apparently one part of a strategy of steady escalation in an attempt to reclaim the islands. Since September, Chinese ships have been spotted in waters close to the islands, including warships and law enforcement patrol boats. The presence of the Chinese Navy and Air Force is only making the situation more dangerous. China is trying to “unilaterally change the status quo of the islands” by using its forces as evidence of their longstanding claim over the islands. All action taken has been in hopes of deterring Japan from further developing the islands, but this recent escalation goes to show that the problem could soon get out of hand. Not only is the situation, which has enraged Chinese and Japanese citizens alike, becoming more volatile, it is also causing economic damages to both nations. Reports are now saying that these economic consequences could be disastrous. The United States has not abstained from making declarations on these disputes. While the United States maintains that it takes no side on this territorial dispute, Washington acknowledged its belief that the islands belong to the Japanese. 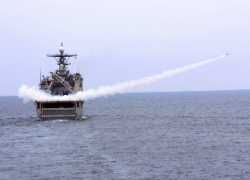 The United States has also officially voiced its concerns over the situation, stating that rising tensions and miscalculations could have serious negative consequences. There seems to be no sign of tensions easing in the near future either. Japan maintains that it will strengthen the surveillance power of its air force and continues to lodge complaints with the Chinese government over the dispute. As Japan maintains official control over the islands, China’s recent actions are a violation of international law, which forbids one nation from entering another nation’s airspace without having permission. Furthermore, a nation also has the right to expel unauthorized aircraft with force. One can only hope that force will not be necessary to resolve this dispute. China is embroiled in maritime territorial disputes, not only with Japan over control of a group of tiny islands in the East China Sea, but also with The Philippines, Vietnam, Malaysia, and Brunei over the island chains of the Spratleys and Paracels in the South China Sea. The dispute with Japan over the Senkaku (in Japanese) or Diaoyu (in Chinese) Islands has led to angry and violent anti-Japanese protests and demonstrations in over 80 Chinese cities. The dispute between China and Japan over these islands dates back to 1895, when Japan took control of them during the first Sino-Japanese War. The crisis was a reminder of Chinese humiliation, coinciding with the anniversary of the September 18, 1931, Japanese invasion of Manchuria, followed by 14 years of occupation. The Japanese government’s purchase of three of those islands from their private Japanese owners acted as the trigger for the demonstrations. China considered the purchase a gross violation of its sovereignty, although it has never physically occupied the islands. The islands, which are rich with fish, oil, and natural gas, are physically controlled by Japan, and are also claimed by Taiwan, which is geographically closer to the islands than China. China asserts a historical claim but Japan says that China’s interest in the territory followed only after studies showed that the waters were rich in natural resources. In the South China Sea, the US is involved because Beijing has claimed much of the South China Sea as its territorial waters since the early 1990s, which means that foreign ships need to obtain China’s permission before entering those waters. The South China Sea is a strategic international waterway, through which more than one-third of the world’s commercial trade passes, and hence the seafaring nations of India and Australia are also concerned. While Beijing claims that these islands are an integral part of its territory for the last 2,000 years, Vietnam disputes it, claiming both island chains to have been under its rule since the 17th Century. The Philippines claims are based on geographical proximity to the Spratley Islands and Malaysia’s and Brunei’s arise under the United Nations Law of the Sea Convention as the territory falls within their exclusive economic zones. China has been flexing its muscles regarding its maritime claims, as it needs energy and both the South China Sea and the East China Sea are energy rich. Also, the area is seen as immensely useful to China’s nuclear strategy, as well, as it seeks to possess a credible sea-based nuclear deterrent. The Association of South East Asian Nations, to which all these countries but China belong, has been seeking to resolve the territorial disputes by peaceful means. However, at a recent meeting of ASEAN in Cambodia, the countries could not even agree on a communique because China did not want any regional negotiations to resolve these competing territorial claims, instead preferring bilateral agreement. US Secretary of State Hillary Clinton supported regional negotiations and a binding code of conduct in that region, which China dismissed as meddling in its internal affairs. The US has often signaled China that its interest lies in upholding the principle of the freedom of navigation but China remains suspicious, contending that the US has been reassuring the other countries that it supports their claims against China and is intent on containing China. The US has repeatedly assured China that it is neutral in territorial disputes across the region, and both Secretaries Clinton and Panetta have called for peaceful resolution of territorial disputes among these states in accordance with international law and the Law of the Sea Treaty. However, the US is under a treaty obligation to come to Japan’s aid if it is attacked. The stakes are indeed high, as these disputes can lead to dangerous missteps and perhaps even the use of force. Thus, the US efforts to find a peaceful resolution are critical. Ved P. Nanda is a distinguished Professor of International Law at the University of Denver Sturm College of Law. In the wake of wide-scale protests in Tokyo on June 29 over the restart of two Kansai Electric Power Co. nuclear reactors, the Fukushima Nuclear Accident Independent Investigation Commission released an 88-page report that describes Fukushima as a “profoundly man-made disaster.” The report disputes the government’s argument of the failure of the Fukushima cooling systems as due to an unavoidable natural disaster; instead, it argues that the events of March were born out of Japanese culture and willful negligence by Japanese executives, regulators, and government officials. 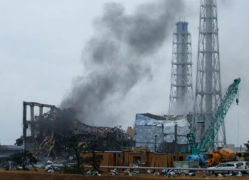 After being hit by an undersea megathrust earthquake and the subsequent tsunami in March 2011, the Fukushima Daiichi nuclear power plant in Japan lost connection with the electrical grid and its backup generators, which crippled the cooling system and subsequently melted down the plant. However, according to the recent report released by the Fukushima Nuclear Accident Independent Investigation Commission, the failure of the Fukushima reactors, which triggered a series of reactor safety investigations across the globe and widespread backlash against the nuclear energy industry in Japan and overseas, “cannot be regarded as a natural disaster.” The report departs from other government-sanctioned reports that concluded the reactors withstood the earthquake, only to be disabled when the ensuing tsunami slammed into the plant. Instead, the report argues that the plant’s cooling systems were likely damaged during the earthquake due to a lack of safeguard brought about by the “collusion” between Tokyo Electric and the Nuclear and Industrial Safety Agency to avoid implementing new safety regulations. With newspaper polls in June showing as much as 71 percent of the Japanese population opposing the restart of Japan’s nuclear energy program, this attribution of the failure of the Fukushima reactors to a cultural phenomenon may be seen by some as (and may very well be) an attempt by the Japanese government to win back the Japanese public through calming their fears of the dangers of nuclear reactors. Regardless, whether or not the report is a policy ploy, the failure to safely use nuclear energy and adhere to proper safeguards for any reason remains a concern for the international law community at large. Indeed, Japan is a member to the Nuclear Safety Standards (NUSS) of the International Atomic Energy Agency (IAEA). However, because IAEA was not involved with the nuclear activities of the Fukushima reactor, the safeguards were binding only on a voluntary and selective basis. Even nuclear problems cast as “made in Japan” are not mindful of state borders: problems”“made in Japan” are exported to other countries as demonstrated by recent cases of radioactive material from Japan washing onto U.S. shores. As such, in the wake of the Fukushima disaster, ensuring that state actors utilize nuclear energy in a safe way may require a global examination into best practices and possibly into whether non-binding standards need to become binding commitments.